Jackelynne Silva-Martinez was born in Cusco, Peru. She attended elementary school, middle school and part of high school at different cities within Peru, including Cusco, Arequipa, and Lima. She then moved to Paterson, NJ and graduated from Eastside High School. Jackelynne earned two bachelor degrees from Rutgers University; one in Mechanical and Aerospace Engineering, and a second one in Spanish Translation and Interpretation. She earned a Certificate in Lean Six Sigma from the Lockheed Martin Greenbelt Program, and a Certificate in Engineering Management from Drexel University. Jackelynne obtained a Master's Degree in Aeronautical Science with concentration in Human Factors Aviation/Aerospace Systems from Embry-Riddle Aeronautical University; and a second Master’s Degree in Aerospace Engineering with concentration in Space Systems Integration at Georgia Institute of Technology. Jackelynne is an alumna of the 2015 Space Studies Program from the International Space University. Jackelynne works at NASA Johnson Space Center in the International Space Station and Exploration Mission Planning Operations within the Flight Operations Directorate. She worked as a Mechanical Engineer and Test Operator at NASA Jet Propulsion Laboratory on the Robotic Manipulators and Deployable Booms group performing verification and validation ground tests for the Mars Science Laboratory, Curiosity Rover mission. Prior to that, Jackelynne worked for Lockheed Martin Space Systems Company as an Antennas Mechanical Design Engineer and as a Systems Integration and Test Engineer for commercial and government satellite programs. Jackelynne is the founder of the ﻿Centro de Ciencia, Liderazgo y Cultura﻿, which brings topics of science, leadership and culture to the young generation at an international level. She and her husband have a son and a daughter. She enjoys reading, traveling, dancing, and learning from different cultures. 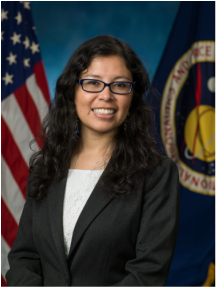 Her interests include human spaceflight, mission operations, space architecture, systems engineering, project management, STEM and STEAM initiatives.